I met Emily a year ago at a lounge room reading called 'cell' that Elena Gomez hosted. Emily gave me a copy of her chapbook LIKE published by Marty Hiatt's bulky news press in Melbourne. This is the scale I've loved all my poetry life - lounge room readings, chapbooks, generous book giftings and it's great that Emily's poems have been brought out via a quietish no-big-fanfare competition (in memory of Noel Rowe) at Vagabond Press - a genuinely independent small press. Meaning that Vagabond doesn't ask for money from institutions, government or private, to publish books. Much praise goes to Michael Brennan, Jane Gibian and Kay Orchison at Vagabond Press. 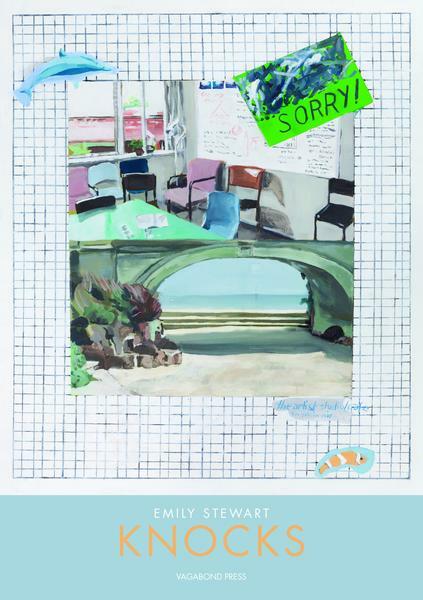 The cover art for Emily's book by Liang Luscombe quotes Linda Marrinon's famous early 1980s abject post-punk anti-aesthetic painting "SORRY!". In the thirty or so years since the initial artworld-shock-effect of that deliberately faux-naive picture everything has become super-corporatised and 'marketable' and these days the painting functions as an acceptable kind of cool apology offering comfort to no-longer-shockable gallery visitors. Emily's poems carry something of the initial disruptive intention of Linda Marrinon's statement as a kind of continuum of subversion. Over a decade ago, U.S. poet Arielle Greenberg developed an aesthetic theory that she called the "Gurlesque". That's 'gurl' with a 'u' - a mild mimicry of burlesque. The term describes women poets raised during the feminist years of the 1960s, 70s and into the 80s, who now, although they're from different backgrounds, share a commonality in their writing. Poetry that combines "the serious and the frilly" and that has "a particular way of writing through and about gender". Greenberg says "In Gurlesque poems, the words luxuriate: they roll around in the sensual while avoiding the sharpness of overt messages, preferring the curve of sly mockery to theory or revelation. Gurlesque poems are thoroughly enmeshed in the visceral experiences of gender; these poems are non-linear but highly conversational, lush and campy, full of pop culture detritus, and ultimately very powerful". Recent ozpo seems to be a considered continuum rather than a brash arrival which is why, apparently, we didn't know we were disappointed. Emily's poems are a definite and special component of an enlivened continuum. I read recently that Paul Valéry said something like 'the purpose of poetry is to recreate the poetic spirit in the reader' - a kind of transaction occurs - poetry makes poets - and when that occurs the poems can be called 'generous' - for me Emily's poems have that effect. Or what, to make yet another quote, Chris Kraus says - I am 'struck by the thrill of transmission'. So - Knocks - about, back, on the door, on wood, school of hard ? There is no title poem - it's up to you. And meaning can be as various as the poems. Emily's poems are urgent but the tenor isn't. Most of them are packed with cryptic imagery so they come into focus gradually like Canberra does from the Federal Highway. They are 'a thinking thing' - meaning, and this is also about poetry in general, that a poem is something instrumental, a thing to think with and it's processual - meaning that it is part transference part temporality - made of moments, spots of time (from W. Wordsworth's 'The Prelude'), part of the scatty continuousness of living. What is a poet's intuition - an integrative intelligence, tracking, offroading, unfastening imagination. Does Emily track, pick, pinpoint, isolate? Yes she does and she also erases. The erasures are fun, plus, they 'make sense'. They're condensed renditions, discerning digests for smooth reception. Lydia Davis's stories get down to 'I sit/I will/I will/I found/I go/ I have' or 'he lives/his car/he's not/his apartment' & VirginiaWoolf - 'the reflections one might have let glom. it was impossible .'... Susan Sontag's Where the Stress Falls is erased to the quick - 'Collect poems, produce superior poems/writing poetry is writing prose but it is the margin/Poetry kills in the province of the difficult' - well, that's saying something isn't it? Emily Stewart's poems provoke all kinds of connotations at the edges of meaning. They knock into each other both by design and by chance. The blurb says "this is poetry that moves" - it does - but I'll change that to "this poetry has kinesis". These poems provide a variety of stimulants for any time of day and any kind of mood. I wish Knocks every best possibility and open reception on its coming trips through the ozpo zone and I wholeheartedly commend this remarkable debut book of poems to you.